Trussardi Uomo is legendary among fans of powerhouse fragrances. Though I've never smelled the original version of this, apparently Trussardi was this nail-eating behemoth of a leather scent that was so powerful it set off fire alarms from miles away. Obviously that's my editorializing, but you get my point with this. I'm sure I would have loved Trussardi Uomo back in the day. This is a review of the current version of Trussardi Uomo, which is an almost pure leather fragrance. Leather fragrances come in many varieties, and can smell like tan-colored leather (Knize Ten, Worth Pour Homme Haute Concentration, e.g. ), like animal hide (Sienna), like leather gloves (The Highwayman), or oily (Pinaud Clubman Special Reserve), just to give a few examples. Trussardi Uomo smells like black leather, of the Fonzie motorcycle jacket variety. It goes on smelling very dark and oily, and it sustains that edge for its entire life on your skin. The dark aromatics like patchouli, orris root and oakmoss never overwhelm the leather smell, and are there merely to give the scent its trademark Eighties weight, and to blast the testosterone level out of the ballpark. Though it doesn't quite have brain-shattering power, the current version of Trussardi is nothing to scoff at. Don't be fooled by its relatively tame, petroleum-like opening scent. It's fairly strong, but nothing that would kill a plant. I'm assuming that you're going to try Trussardi because you like power scents, so just be patient with this one. Trussardi Uomo is one of the few fragrances I know (Giorgio For Men and Francesco Smalto Pour Homme are two others) that actually increases in strength the longer you wear it. Therefore you do NOT want to apply more than three or four sprays of this, because within an hour or two you're going to regret it. As time passes, you can smell the fragrance opening up, with the heavy aroma of oakmoss and patchouli piling on top of the black, oily leather. By the third hour, Trussardi will hit its stride, unleashing clouds of balls-out sillage that will fill the room and take out any L'Eau d'Issey fan unfortnate to be within ten feet of you. This is an amazingly macho scent, and it lets everyone around you know that you're not f*#cking around. 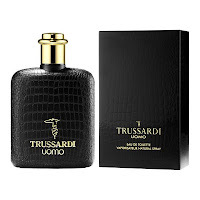 Trussardi Uomo is a heavy and loud scent, and I can't simply say that all leather fragrance fans are going to like it. This is like leather on amphetamines and steroids. It's not polite or gentlemanly like a lot of other leathers, because at the end of the day, this is really an Eighties powerhouse at its core. For power fans, however, this is a must-buy. It's a weird one for sure in the way that you spray it on, sniff it and think "this isn't a powerhouse" then 15 minutes later - BOOM! A big leathery fist knocks you on your back! A refined, macho powerhouse for sure...!